The Grumman company in late 1929 developed a practical aircraft float that included a retractable wheel undercarriage. 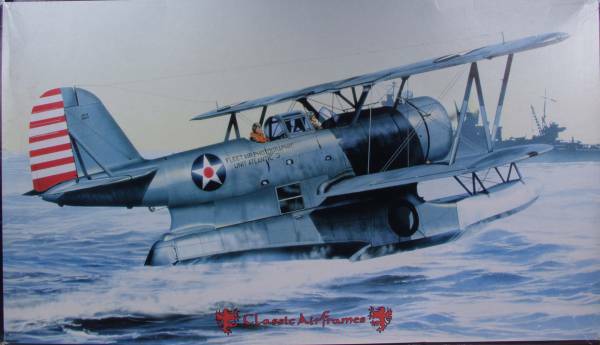 First tested on the Chance Vought O2U-1 biplane, it was then used in a design to meet the U.S. Navy requirements under the designation XJF-1. First flown on May 4, 1933 the XJF-1 was an equal span, staggered wing single-bay biplane with a metal fuselage and fabric covered metal wings. Its single step float was faired into the fuselage and the wheels retracted into recesses in the sides of the float. Space was provided in the fairing between the float and fuselage for wireless and photographic equipment or for a stretcher. It was powered by a Pratt and Whitney R-1535-62 Wasp engine and the success of the initial trials resulted in an order from the Navy for twenty-seven production aircraft under the designation JF-1. The JF-1 differed from the prototype in having an R-1830-62 engine rated at 950 hp. The first Navy unit to receive aircraft was VS-3 aboard the U.S.S. Lexington which received eighteen of them, using them for photographic, target tug, rescue and ambulance duties. Fourteen similar aircraft but powered by the Wright R-1820-102 Cyclone engine were supplied to the U.S. Coast Guard. under the designation JF-2. The U.S. Navy also acquired five Cyclone powered aircraft in 1935 as JF-3's. As a successor to the JF series, Grumman evolved an improved version specifically for use from carriers and equipped with arrester gear and catapult points. Designated the J2F-1 and known popularly as the "Duck" the new model flew for the first time on June 25, 1935. Eighty-nine of this type were supplied to the Navy. The J2F-1 was powered by the R-1830-20 engine and weighed about one thousand pounds more than the JF-3 fully loaded. Tandem cockpits were provided for the pilot and observer and provision was made for accommodating two additional crew members in a lower compartment. The first armed version to be supplied to U.S. services was the J2F-2 with thirty delivered to the Marines. Twenty-one J2F-3's were supplied to the Navy with R-1820-36 engines featuring increased supercharging and thirty-nine J2F-4's for target towing duties followed in 1939-1940. These completed production of the "Duck" until 1941 when orders were placed for a further 144 of the amphibians under the designation J2F-5. Several of these were diverted to the Coast Guard for air-sea rescue duties and one was delivered to the Air Force for evaluation as the OA-12. Grumman completed sixty-nine J2F-5's in 1941, delivering the remaining seventy-five in 1942 when production was transferred to the Columbia Aircraft Corporation. The Columbia built version designated J2F-6 featured some aerodynamic improvements including a long-chord cowling and production deliveries began in 1943 with thirteen aircraft, 198 being delivered in 1944 and 119 in 1945 before production was terminated. Total production of the "Duck" was 653 machines. In addition to the aforementioned tasks the J2F-6 could also serve as an anti-submarine patrol aircraft with two 325 pound depth bombs on under wing racks. 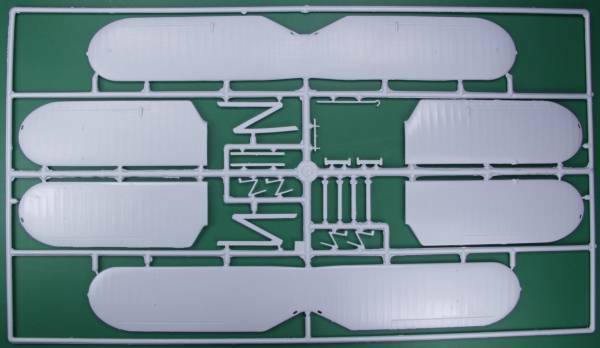 The Classic Airframes kit comes in a two part top open box with nice artwork on the top, Inside is three bags, one contains all the sprues except the clear parts, one contains the clear parts and a third, which was stapled to the inside of the box to keep them from rattling around, contained the resin parts. 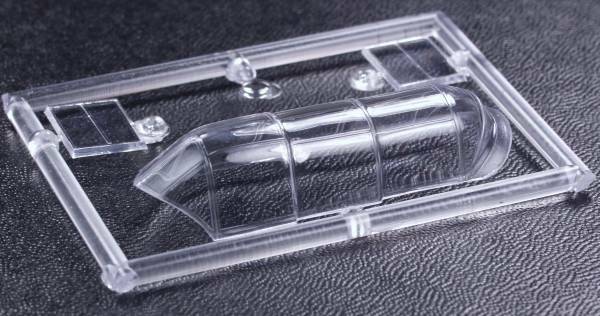 The plastic parts are molded in a light gray plastic with minimal flash on the large parts and a bit more on the smaller parts. The fabric areas are nicely done. The kit features recessed panel lines where applicable and they are fine but had some missing spots that will need to be re scribed in a few places. The surface finish was smooth for the most part but there were some matte areas in a couple places that might need to be buffed out to make the surface look uniform under a coat of paint. Besides the flash the small parts all had a fairly heavy parting line that will need to be cleaned up. As is typical of short run kits there are no alignment pins on the parts. and constant dry fitting is recommended during the assembly. Also the sprue gates are heavy on some parts so care needs to be taken when removing them. I did not find any surface imperfections that would require filling. By my count there are 71 one parts in gray plastic. The canopy was thin and reasonably clear but the other two windows were a bit thick and not as clear but some Future should help them. The canopy is one piece and will need to be cut to open it up, however, Squadron offers as vacuform replacement  if you are so inclined. The resin parts are cast from a tan colored resin and are all nicely molded and I could find no pin holes or short shots. They include the engine and propeller shaft, cockpit details, a machine gun for the rear pit and the tail wheel strut for the rear of the float. The machine gun barrel was bent but should be fixable and all other parts were intact when received. 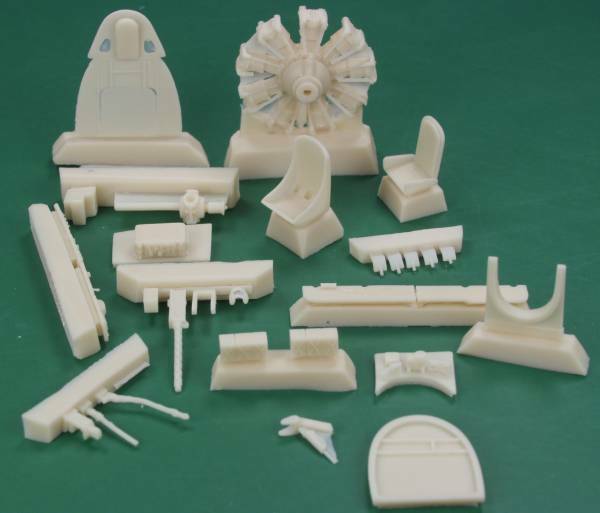 All together there are 29 resin parts bringing the total parts count to 103. These can be seen in the photos below. The decals look thin, well registered and with minimal carrier film. They are printed by Microscale so should go down well. 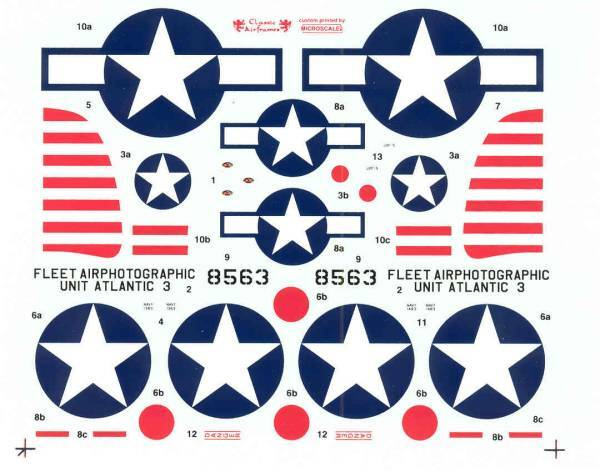 Markings are provided for three aircraft, an OA-12 from Alaska in 1947, a J2F-5 in an Atlantic scheme from 1941 and a J2F-5 from the U.S.Coast Guard from 1943. See below. The Instructions are printed on an 8 1/2" x 14" sheet folded in half with a half sheet inserted in the middle creating six pages. Page one is history and specifications, page two is a part map, the rest are assembly instruction. The painting and marking instructions are on a separate 8 1/2" x 11" page printed on one side and a half sheet the same way. Of note the instructions strongly recommend that several of the molded landing gear parts be replaced with styrene rod or stretched sprue and that sort of recommendation usually means it needs to be done if you want the landing gear to survive the weight of the kit. For a limited run kit this one looks like it should go together with mimimal hassles and as usual dry fitting is recommended but with a little care one should end up with and interesting and attractive model. Some build notes and photos can be found here.